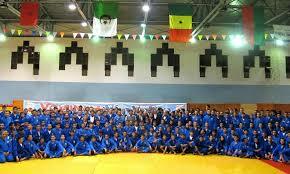 On June 25, 2015 Office delegations, athletes Vovinam Vo Danh Hai due – Secretary General World Vovinam Federation as consular team has left for the capital Moscow, with a delegation representing the Ministry of Culture, Sports and Tourism to attend the “Vietnam Cultural Days in Russia” took place from now until July 2, 2015. Program by the Department of International Cooperation (Ministry of Culture – Sports – Tourism) in collaboration with the Vietnam Music Hall, National Music Academy of Vietnam, Cinema Department, Institute of National Culture and Arts Vietnam, Vietnam Fine Arts Museum, Tourism, General Sports and some related organizational units, with activities aimed at introducing promote Vietnam subculture to a friend international, and to promote cooperation in the fields of culture and tourism between the two countries Vietnam – Russian Federation. Vovinam Vietnam team with the participation of six athletes was the national champion and international celebrities like Nguyen Binh Dinh, Nguyen Khac Huynh, Nguyen Van Cuong Tran Thuong Pham Thi Bich Phuong Mai Thi Kim Thuy and will join the repertoire presented showing technical characteristics of Vietnamese martial arts as: Crushing leg attack, Safeguard women, Song and YTD sword training in performing arts program unique, impressive people Ethnic Vietnam.